As a coordinator, you witness real life change start to happen within your class members. Help continue to motivate them and mark this milestone with a personalized Graduation Certificate. So where do you find them? Simply click "Resources" on the left navigation of the Coordinator View. 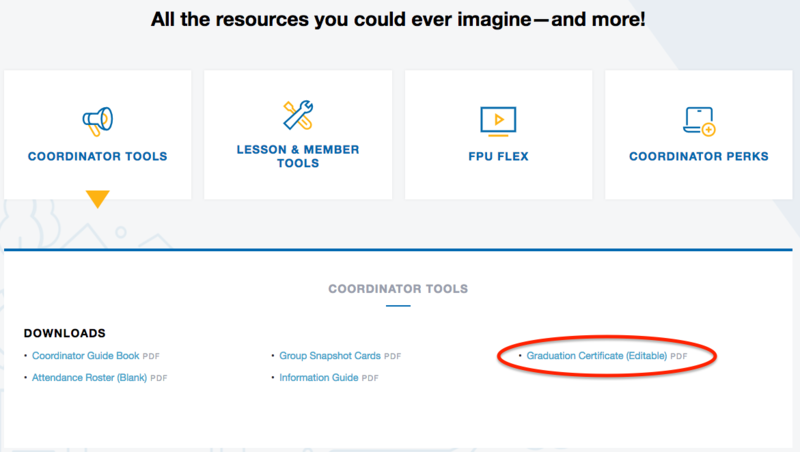 Under the Coordinator Tools sections you should see a downloadable PDF link titled "Graduation Certificate (Editable). Click the link to download the PDF and open in the latest version of Adobe Acrobat to edit and save the names of your members. You may also order Graduation Certificates from CoordinatorCentral.com. Keep in mind that these come in packs of 20! Please allow 7-10 business days for delivery.